In what other ways does Ella show she may be thinking about her friend, Grace? How does your playground support cross-age play? Why not give this group of one-year-old children child-sized brooms? Is it useful for them to confront non-trivial problems by using big brooms and be successful? Why do the children persist in spite of the difficulties? How do changing terrains require children to think on the fly and make clever micro-decisions? How do children's social interactions, even at the youngest ages, influence their risk-taking behaviors? As teachers, how can our classroom environments reflect the infants' need for physical as well as cognitive challenges? Is it possible that the tunnel was intended as an invitation to go through, not over? Are you careful to take special note of actions that you did not expect? 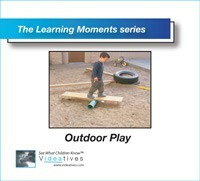 Can you assess your outdoor play structures in terms of their affordances for multiple users? What materials on your playground offer children opportunities to explore physics concepts? Why is it that the game of two children on a seesaw is not particularly suited for time tuning an understanding of balance? What familiar games or thymes do your children adapt to match the physical features on your playground? What behavior can you observe to judge the synchronicity of their play, for example, the ways they signal each other for a change in the direction or timing of a movement that is part of the group game? How do the challenges posed by a cylinder differ from other familiar climbing surfaces? What other playground structures or loose parts foster cooperation and peer collaboration? When adding materials, why do you think the children include or exclude certain items? What criteria do the children use to determine when their path is finished? Can you think of other ways to encourage children to think about the completeness and functionality of their path? What other problem solving strategies do you notice Jensen using as she works to stack the large automobile tires? How does her goal change after she successfully makes a five tire stack? When the boys have trouble establishing communication, what strategies do they invent together in an effort to overcome the challenges? How might you help the children revisit their theories and extend the learning encounter? How do you think the children might solve this new problem? Do you think the challenge could encourage them to work together? What do the children's actions tell us they understand about the rules of the game? What strategies does the teacher use to help the children reflect upon what may be the source of the problem and work as a team to explore the ideas offered by individual members of the group?